The 1841 whaling ship Charles W. Morgan has embarked on her 38th Voyage to historic ports in New England. The journey began May 17 with the Morgan being towed down the Mystic River en route to New London, CT. This was the first time the ship has been below the Mystic River Bascule Bridge since she arrived at Mystic Seaport in 1941. A month-long fitting out period is taking place in New London. Due to the shallow depthof the Mystic River, the ship cannot be properly ballasted for sailing at her berth at Mystic Seaport. The ship will be used for sail training out of New London on June 7, 8, 11 and 12, 2014. Click here to view the live chart of the voyage. On June 14, the Morgan will leave New London and begin her journey up the coast of New England. Due to her status as a National Historic Landmark, the ship will proceed to each scheduled port on a one-day sail so she can be safely berthed by nightfall. As weather conditions are a determining factor in the decision to head to sea each day, each port transit is scheduled with a three-day window of opportunity with the intention that the ship will sail on the first acceptable day. Once in port, the ship will be open to the public on select days. A traveling dockside exhibition will feature historic interpretation, live demonstrations, music and more. The leg of the voyage on Stellwagen Bank has a somewhat different operating plan: the Morgan will moor off Provincetown as a base for day sails onto the Marine Sanctuary in collaboration with the National Oceanic and Atmospheric Administration. There will be no dockside exhibition or visitor access to the ship in Provincetown, although there will be extensive online programming during the day sails and the Massachusetts whale watching fleet may choose to follow the ship. The 38th Voyage of the Charles W. Morgan is the first time the whaleship has left Mystic Seaport since she arrived there in 1941. Please note: All dates are subject to change due to inclement weather and unforeseen operating conditions. June 14 – 16 Sailing window from New London, CT to Newport, RI. June 17 The ship will be open to the public at Fort Adams State Park in Newport (no dockside exhibition). June 18 – 20 Sailing window to Martha’s Vineyard, MA. June 21 – 24 The ship will be open to the public at Tisbury Wharf in Vineyard Haven, with the dockside exhibition. 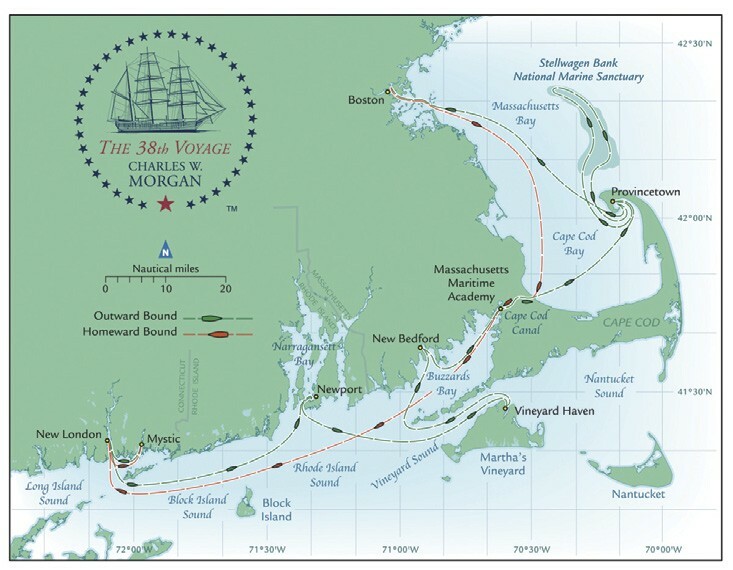 June 25 – 27 Sailing window to New Bedford, MA. June 28 – July 6 The ship will be open to the public on State Pier in New Bedford, with the dockside exhibition. There will be a special July 4th celebration and many other community activities. July 7 – 11 Sailing window to Provincetown, MA via the Cape Cod Canal. There will be an overnight stop at Massachusetts Maritime Academy (no public access). July 11 – 13 Day sails on Stellwagen Bank National Marine Sanctuary. Overnight mooring in Provincetown Harbor (no public access). July 15 – 17 Sailing window to Boston, MA. 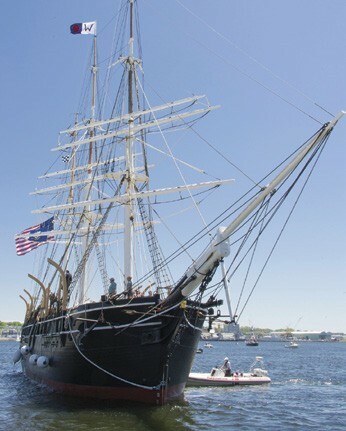 July 18 – 22 The ship will be berthed next to the USS Constitution at Charlestown Navy Yard in Boston, and open to the public with the dockside exhibition. July 23 – 25 Sailing window to Massachusetts Maritime Academy via the Cape Cod Canal. July 26 – 27 The ship will be open to the public at Massachusetts Maritime Academy, with the dockside exhibition. The visit coincides with the centennial celebration of the opening of the Cape Cod Canal. July 28 – 30 Sailing window to New London. August 6 – 8 Sailing window to Mystic Seaport. August 9 Homecoming celebration at Mystic Seaport. Mystic Seaport has received many requests from people who would like to follow the Morgan’s 38th Voyage by boat. To ensure a safe experience for all, the museum has provided answers to frequently asked questions. As always, mariners should follow the USCG Navigation Rules, also known as the Rules of the Road. Throughout the voyage, the Morgan may be under tow or being pushed, may be restricted in her ability to maneuver, and constrained by draft while navigating in a channel. Please obey the rules. How much clearance should I give the ship? Vessels should allow 50 yards on either side and behind the tug and 100 yards in front of the Morgan. The Morgan is conned from the stern and her high bulwarks and freeboard create a wide, cone-shaped blind spot in front of the ship. Vessels within 100 yards of the ship’s bow may not be visible to those onboard. Boaters are strongly advised to stay out of this zone for that reason. What is the daily operating plan? Because the ship doesn’t have an engine, she will be towed out of each departure port. The crew expects to have the tug on the hip while maneuvering in close quarters inside of harbors, and also to be on a towline in open water. The vessel will be towed until within striking range of each arrival port under sail. The towline will be cast off and sail set as time and conditions allow. The ship will be towed into the arrival port. There may or may not be a few sails set while under tow, depending on the conditions. Is there a spectator fleet? Mystic Seaport is not managing a spectator fleet, nor contracting with other charter vessels to offer opportunities to see Morgan under sail. What support vessels will be with the ship? There will be several support vessels with the ship at all times when underway. The tug Thuban and F/V Roann will be nearby, as will two RIB tenders. Whaleboats may be launched underway and rowed, or towed into or out of ports during arrivals and departures. Does the Morgan have AIS? Yes, the Morgan, Thuban and Roann will have AIS. Mystic Seaport will have a live chart on their website displaying their current location. Where and when are the best opportunities to see the ship? Because the voyage is seeking to replicate 19th century sailing and wind and weather conditions will determine what happens each day, there is neither a set course nor a projected ETA and no way to tell boaters where to be for the best view. Those who desire to follow the ship should monitor the website and VHF channels 13/16 for the latest updates. This historic voyage should be a unique opportunity to see one of the oldest ships in the country sail for the first time since the 1920s. For the latest status of the ship, updates on her schedule and information on her captain, 38th Voyagers and “The Stowaway,” visit mysticseaport.org/38thvoyage.